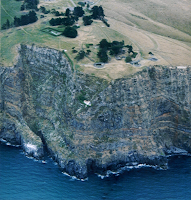 As with the rest of Christchurch Godley Head has suffered the forces of the successive earthquakes since September 2010. In September the Head was virtually unaffected, in February most of the buildings escaped serious damage, but the June shakes have accentuated the damage of February and added a whole raft of their own. 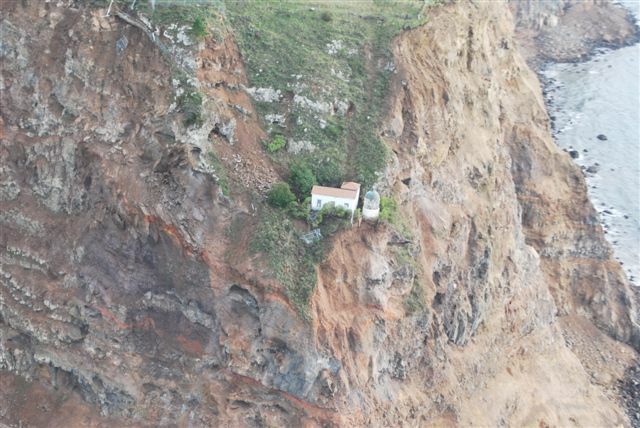 The hillsides around the Head have needed remedial work to remove dangerous rocks but almost all the serious damage has been close to the actual cliff edges. After February immediate investigations by DOC showed that most of the surface cracks in front of the gun emplacements were shallow and relatively easy to fix. Those in front of gun emplacement E2 (middle emplacement) were corrected at the time of investigation. However a large crack close to the cliff face immediately north of emplacement E3 (northern emplacement)was too large and would likely just be fenced off. The area of the lighthouse was badly damaged and that around the explosive fog-horn site also. The three gun emplacement magazines received varying degrees of damage. E1 (southern emplacement) was almost undamaged. It is possible the automatic lighting in E2 could be moved there to give the visitors an accessible magazine. We will keep you posted on this. E2 magazine has extensive cracking in the walls and ceiling of the access passage but little in the actual magazine. It is currently off limits to visitors. E3 magazine has extensive cracking in the areas of the entrance stairs and tunnel but again the magazine itself has little damage. The June 13 2011 quake sequence has accentuated much of the February damage. The ground cracks south of E1 have doubled in size, there has been limited slumping of DOCs investigative trench in front of E2, but no new cracks. This proves the value of their immediate corrective actions. The large crack north of E3 has probably doubled in size and is now over 1.5 metres wide in places and up to 2 metres deep. Any additional sizable quakes will likely cause this piece of the cliff face to shear off. DOC intend to fence off this crack as a dangerous area. The three gun emplacements have various degrees of cracking in the concrete of their structures. Some small amounts of plastering have fallen off but considering the large amounts of reinforcing steel in the structures their is no current danger of collapse. Concrete paving around the emplacements has been damaged. One of the more serious is beside the E2 magazine sliding escape hatch. This will need fairly urgent remedial work to avoid the winter's rain getting in behind the magazine's structure and undermining it. 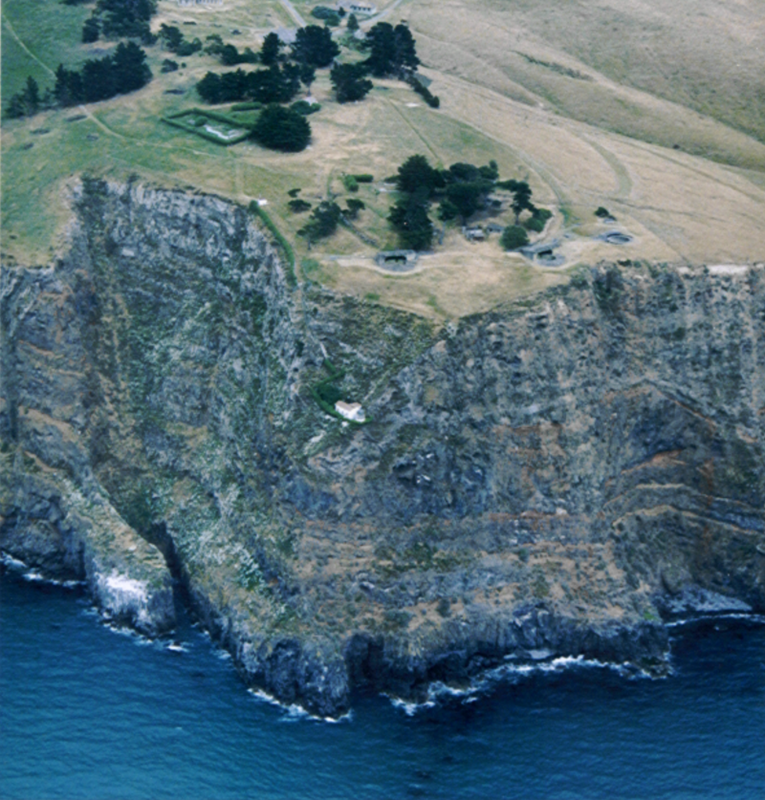 Since June 13 the gun emplacement area is temporarily out-of-bounds to visitors. We will keep you posted on when its again open. The three battery observation posts (BOP) received little damage in February but we have not checked them for June. We will let you know what we find. BOP 2 at the cliff edge has spalling in one of its front window pillars, but appears structurally sound. The miniature range, plotting room and engine room complex received little damage in February. The most significant is a long crack in the paving outside of the engine room. We will let you know about June. The worst damage from February was to the areas of the lighthouse, the explosive fog signal and the search light emplacements. The tunnel to the search lights was virtually undamaged, though the approach track has had some slips and is closed to visitors at present. The search light emplacements and the path to them from the far end of the tunnel are extensively damaged. The path in fact has ceased to exist and is now just a shingle scree. The first emplacement has had its roof parapet pierced, this parapet was put on in 1941 to protect the emplacement from falling rocks. The most eastern emplacement is in tact. The peninsula on which the explosive fog signal is placed has been badly shattered and the small tower on top of the signal has toppled. While the signal has not been accessible to visitors, expeditions have been considered to visit this rare heritage site, any future access to the signal will now be very difficult. The lighthouse is in serious peril and it surrounds have received major damage. The 1865 top, lens and mechanism were moved during the war to clear the guns field-of-fire. It was mounted on a new tower some 40metres down the cliff face. February saw extensive damage to its approach path but the light and the 1920's compressor building were mostly untouched. 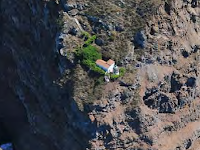 A fly-by has shown the June 13 quake has sheared off much of the cliff face to immediate south of the lighthouse, leaving the building in potential danger of toppling. Taylor's Battery and a few other structures have not been visited yet but we will update you on the state of all structures and the land of the Head as we are able to more clearly access what has happened.